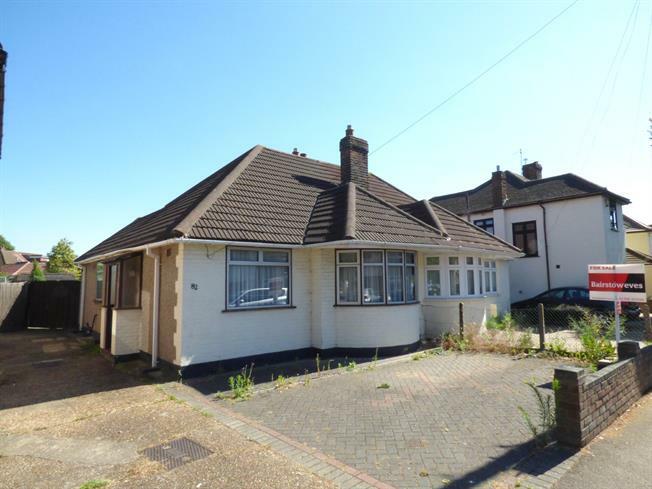 3 Bedroom Semi Detached Bungalow For Sale in Hornchurch for Fixed Price £350,000. Guide Price 375,000 - 400,000. A great opportunity for this three bedroom bungalow within walking distance to Elm Park high street and station. Located 0.4 miles from Elm Park Underground station and walking distance to local bus routes. There are numerous schools nearby such as Benhurst Primary school and Abbs Cross Academy & Arts College. This bungalow has three bedrooms, one of which has built in wardrobes and the main bedroom has a large round bay fronted window. There is a large living room and a dining room with patio doors that lead to the garden. The kitchen is at the rear of the property and there is a family bathroom with a shower/bath unit. The garden has a large patio, a good sized lawn and a garage. There is a drive at the front and a shared drive to garage.